Sidenote: I realize I haven’t posted a blog in quite a while. The last few months have been crazy intense with numerous assignments, frantic image editing and long hours helping to edit video. Not to worry, I haven’t ditched the blog…there is much more to come in the next few weeks. This blog post is a bit long as this was one of the best assignments of my entire career and we got a wide variety of images. Even though there have been numerous articles posted about the “Lighting the Spirit” whitewater kayaking shoot for Elinchrom and Red Bull Photography, I thought I would post a blog here detailing some of the aspects that have not been covered in the other articles that have appeared on Redbull.com, F-Stoppers, and elsewhere. First off, my thanks to Elinchrom and Red Bull Photography for making this happen. This shoot was a long-time coming. I originally discussed a possible ELB 1200 shoot with Elinchrom and Red Bull over two years ago after seeing one of the first ELB 1200 prototypes. This assignment, and the idea for this shoot, was a long process, that included a fair amount of debate and thinking, which I think can be seen in the images. 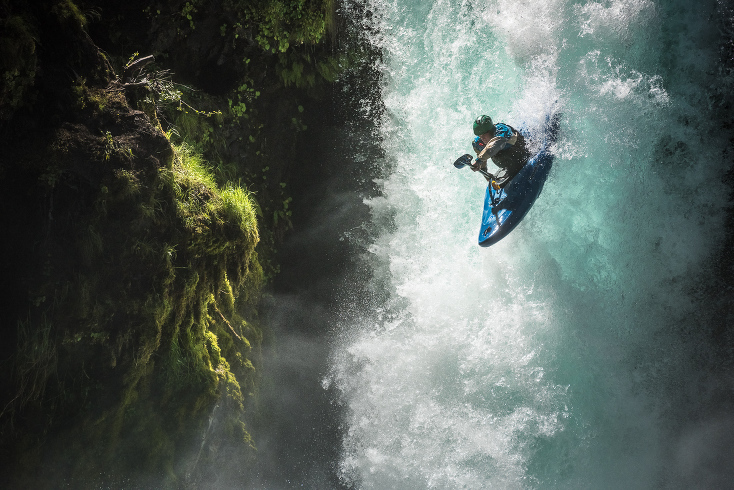 Once we decided on the sport of whitewater kayaking, Red Bull introduced me to Rafa Ortiz, one of the world’s best whitewater kayakers–especially when it comes to dropping big waterfalls. In discussions with Rafa, we decided on Spirit Falls, which is on the Little White Salmon river near White Salmon, Washington. I was a bit apprehensive about shooting at Spirit Falls because it has been photographed so many times and by many of my peers in the adventure sports photography world. Nevertheless, we needed a waterfall that was somewhat easy to access and one that Rafa and the crew could run over and over. In the end, Spirit Falls was one of the few places that really could work for this project. To round out the crew of athletes, Rafa brought in Rush Sturges and Liamm Fields, both of whom are world-class kayakers in their own right. Above is an image of Liamm going straight in on Spirit Falls. For months before the assignment, I had been talking with Elinchrom about different possibilities, including rappelling behind the waterfall. I was really psyched on getting behind the curtain as the possibilities there seemed wildly different than an average portrait. Once we got to White Salmon and went to check out the waterfall, we realized there was no gap between the falls, as there usually is, where we could rappel behind the waterfall. Usually Spirit Falls is a smaller, narrow waterfall with a gap between it and the other side of the falls, not a huge curtain of water as seen in the images here. Because the entire western US had an epic winter, there was so much snowmelt this year that we had to wait until late May for water levels to get down to a runnable level. That epic winter made for epic amounts of runoff, which also meant that the waterfall was a solid hundred foot wide curtain of water when we arrived in late May. This was a four day assignment, with one scout day and three shoot days. The scout day involved a full day of bushwhacking around different sections of the river to check out other possible shoot locations. This being the northwest, there was plenty of poison oak to deal with. We were careful, but even with care, I still came home with poison oak in several places. The scout day was a bit brutal. The incredibly hot weather and dense forest approaches didn’t help. Even so, we did manage to find a few other sections of the river that would work for additional action and lifestyle images. After the scout day, we laid out our plan for the shoot. Before shooting any action, we wanted to get a wide variety of portrait and lifestyle images in the bag. The idea was that once we started shooting the action, if anyone got hurt that could end the entire shoot. Hence, getting a wide variety of non-action images seemed prudent. We spent the entire first day shooting portrait and lifestyle images near Spirit Falls and also at other spots on the river. We started with underwater shots having Rafa doing barrel rolls while being lit from above using a Kupo Big Boom, which is a beefy 12-foot boom arm. To get the above image, I put my Nikon D810 into a Ewa-Marine bag with the Skyport Plus HS on top and used a 24mm lens. The reason I used a Ewa-Marine bag instead of a surf housing, like my CMT surf housing, is that I needed to be able to adjust a wide variety of settings both on the camera and on the transmitter. It took a little trial and error to dial in the settings but once we got there, we were able to get some pretty cool underwater shots and control the lighting very accurately. Afterwards, we moved on to a location that was very close to Spirit Falls, just on the opposite side of the gorge from the actual waterfall. This small waterfall was a perfect place to shoot a series of portraits and freeze the falling water, as shown below. For the portraits above, I shot with both a Nikon D810 and with a Hasselblad H5D 50c WiFi. As you might imagine, this spot was quite wet. I wrapped the Hasselblad in a plastic cover to keep it from getting too wet. When shooting with the Nikon, I just left it naked as I have tons of experience shooting with a wide variety of Nikons in full on rain and have had not any issues. The portraits are definitely more staged than any of the other images we captured but as with all of my assignments, it isn’t always about the action, and creating a wide variety of images to show the entire experience is critical for most clients. These portraits also show just how versatile the ELB 1200 is for a wide variety of scenarios. We used the Action heads when shooting with the Hasselblad (because it has a leaf shutter and requires fast flash durations) and we used the Hi-Sync heads when shooting with the Nikon to stop the motion of the falling water. As a side note here, I was intentionally trying to kill one of the three ELB 1200 packs we had with us on this shoot. I wanted not only to create cool images for Elinchrom’s marketing but also see just how tough these packs are in the wild. After we were done shooting the above portraits, I borrowed Rafa’s paddle and diverted a serious amount of the waterfall onto the top of the ELB 1200 with a flash head still plugged into the top of the pack. Below is a shot of it after I gave the paddle back to Rafa. We shook it off, and dried off the water on the top of the pack and tested it out. It still worked fine. I was pretty surprised as there was a lot of water hitting the pack for several seconds. With a flash head plugged into the top of the power pack there was a potentially serious failure point where water could enter the pack. Apparently Elinchrom has considered this possibility, which explains why the cables fit snuggly into the top of the pack, creating a water tight seal. After this experiment, I realized the only way to really kill the pack would be to toss it into the river, but as I wouldn’t do that with my own gear that seemed a little over the line in terms of trying to kill a pack. Note that the flash heads have slits in the back of them to cool the flash head so I did not put those naked into the waterfall. While scouting, we found that there was a small hole just next to Spirit Falls where we could rappel behind the curtain of the waterfall. On the second day of shooting, we set up the rope and used it to rappel behind the waterfall. I have to say that this was one of the coolest things I have done in quite a few years as an adventure photographer. Dropping through a three-by-three foot opening to get behind the curtain of the waterfall was exhilarating. It felt like we landed on another planet. My enthusiasm, and Rafa’s as well, is apparent in the behind the scened video above. Tom Bear, my assistant and a stellar pro photographer in his own right, rappelled into the cave with Rafa and myself. He held the light and we worked out a few different shooting positions and lighting angles. Here again, I put my Nikon D810 and the Skyport Transmitter into a Ewa-Marine bag to protect it. We put the ELB 1200 into a padded LowePro case and then put that into a dry bag, with the flash head cable running out of the dry bag. The flash head was protected with a heavy-duty clear plastic bag and we used gaffer’s tape to seal the plastic bag. Up top, I put a fully-charged battery onto the pack but somehow while rappelling in it got knocked around a bit, and the battery had shifted slightly. Hence, I had to take the ELB 1200 out of the dry bag and re-attach the battery while getting nailed by the spray that was a constant issue. In doing so, the entire pack got wet, including the top of the exposed battery and the bottom of the power pack. We didn’t really have any choice in the matter so we just carried on, hoping the unit would fire normally – and it worked perfectly. This was one of the most challenging locations I have ever had to work in. While behind the waterfall, there was a consistent high-velocity spray that seemed to shoot into my ears non-stop. It was hard to even look through the camera because my eyes wold get nailed by an occasional jet of spray forcing me to rub them out and clear my vision. Additionally, the Ewa-Marine bag was soaked and any attempt to clear the front lens element just smeared the water in an unnatural way. Honestly, I am shocked we got any usable images down there at all. The image below is a two-shot panorama that is my favorite image from behind Spirit Falls. When we ascended the rope (using mechanical ascenders) to get out of there, I was so jacked up at that point I couldn’t contain my excitement. After our adventure behind Spirit Falls, we set to work on creating the action images. With one light above the waterfall and another on the opposite side of the gorge, over 100-feet away, which acted as a fill light, I set to work to find the actual shooting angles. My first choice was to get as close as possible to the action and shoot while hanging from a rope right in front of the waterfall. This resulted in some pretty amazing images as shown below. In these images Rafa and the crew have run the same line multiple times for me to dial in my timing and catch them at just the right spot. To show the effect of the flash, below are images shot at the same exposures but without the flash. These before and after images show just how powerful and important the flash was in creating these images. Also, note that these images are underexposed because the in-camera settings are set to expose the background correctly so no highlights are blown out. In the case of the right image below, I adjusted the exposure for the sky, which is barely visible and which explains why the image is so dark. Also, because I was shooting with a Nikon D810, which has an incredible dynamic range, those dark areas in the background were easily lifted in the post-processing without adding much if any noise to the final image. All of the action images were created using Elinchrom’s Hi-Sync technology that allows the flash to sync at any shutter speed. For most of the action images we shot with shutter speeds ranging from 1/2,500th second up to 1/4,000th second to freeze the action. When shooting whitewater kayaking, it has been my experience that if you want to freeze the motion of the kayaker you need to use a shutter speed of at least 1/1,500th second or higher. Elincrhom’s Hi-Sync technology allowed us to freeze the motion in a way that would otherwise be quite difficult to pull off with flashes. Before the shoot, I didn’t realize that Liamm and Rush were game to run the falls more than a few times. Luckily for me, they both dropped Spirit almost as many times as Rafa did, which allowed me to get my timing dialed in and also gave us quite a few extra images. After shooting a few rounds right in front of the waterfall, I climbed back up and changed my shooting position. I was very conscious of how many times the kayakers were dropping over Spirit Falls and we made sure we were ready for each descent since we only got one image per drop. The image I had in mind before the shoot was to replicate the ice climbing images I mentioned above. I moved over to the far side of the gorge, so that I was straight on with the waterfall curtain and used a 70-200mm lens to frame up a wider shot, as shown in the images below. I also zoomed in a bit to get a tighter shot once I got the timing down. These images from a little farther away show the entire waterfall and give a better sense of the height of the water fall and the kayakers position on it. At the end of the second day, it felt like I had gone caving. I was soaked from head to toe and coated in mud as shown in the behind the scenes image below captured by Marv Watson. Amazingly, my Nikon was just fine. The camera and the 14-24mm lens I was using while hanging only a few feet away from the waterfall were soaked repeatedly but never seemed to flinch. I must have wiped the lens off a hundred times or more while hanging right in front of the waterfall. One thing I haven’t noted here yet is the approach to Spirit Falls. It isn’t that long or hard of a hike to get down to Spirit Falls, though it is quite steep in a few sections, but when you carry in a fully loaded 90-pound (40-Kg) backpack that simple approach becomes a whole lot more interesting. On all three days that we shot down at Spirit Falls, Tom and I carried in huge packs with the cameras and lighting gear. While going down the 1,000 feet to Spirit Falls wasn’t so challenging, hiking back out each day was a lesson in pure suffering. Thank God the ELB 1200s were as light as they are. It wasn’t just the lighting gear that weighed us down, we also had quite a bit of climbing gear as well as full dry suits to use behind the waterfall. The third and final day of the shoot was planned as a backup – or pick up day. I didn’t know how many times the kayakers would physically be able to run the Spirit. On the morning of the third day Rush admitted he was quite sore. 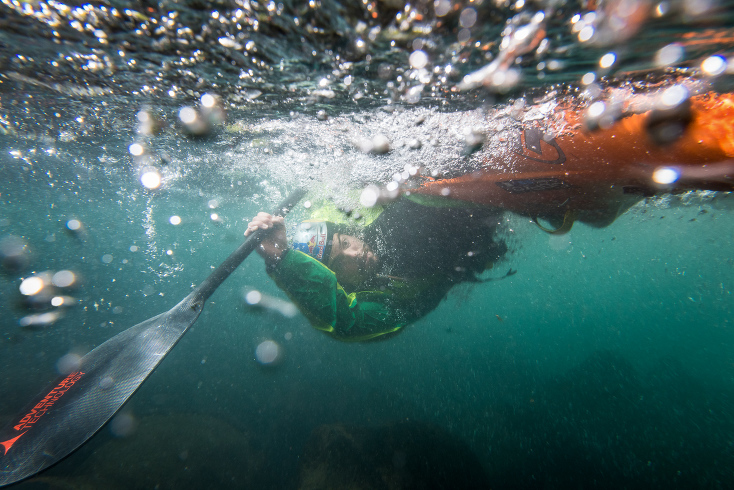 All three kayakers were all absorbing a serious impact every time they ran Spirit. In fact, they told me they had never run it that many times in a single day. Appreciative of their efforts, I asked if we could go back and do just a few more runs so I could dial in a tighter shot. I also wanted to shoot a few images with Rush or Liamm standing on a rock below Spirit Falls, showing the role of the safety boater and giving us a wider range of images. Above are a few images shot on the third and final day of the assignment. Above left, we shot all three kayakers running a rapid known as Chaos, which is actually the most dangerous rapid on the entire four-mile stretch of the Little White Salmon. For this image of Rush Sturges we used two strobes, one on Spirit Falls and another from above lighting up Chaos. In the above right image, we had Rush Sturges stand below the falls on a rock with the swirling cauldron of water below him. Liamm Fields is dropping over Spirit Falls while Rush holds a safety rope. When we created this image, it opened up a whole new set of images I hadn’t thought of before the shoot. After showing the images to Rafa and crew, it was obvious we needed to shoot some other versions of this so Rafa opted to run Spirit one more time to access this rock below the falls. We finished off the shoot by capturing a series of images of Rafa standing on the rock below Spirit Falls. This last shot, shown above, might be the best image from the entire shoot. It is certainly the best lifestyle-type image from the shoot in my opinion. We created so many stellar images that it is very difficult to edit these images. The first image, at the top of this blog post is another of my favorites, as is the one from behind the waterfall. I have several favorite action images of Rafa, many of which are shown here, but I can’t actually decide which one is the best of the best. Please feel free to voice your opinion in the comments section. I have to thank the entire team that worked so hard on this assignment. Bill Stengel, our one man band behind the scenes video guru, who lugged a full RED Epic kit down to Spirit Falls — and captured some amazing behind the scenes footage shown in the video above, Tom Bear, my assistant, and also Marv Watson and Jorge Henao from Red Bull Photography who shot the behind the scenes stills and also carried down a few extra items for us each day. Without your help gentlemen, and that of our illustrious athletes, this shoot just would not have been possible and the resulting images would have been far less interesting. Lastly, my thanks again to Elinchrom and Red Bull Photography for making this happen. If you would like to see more behind the scenes stills jump on over to the Red Bull Photography website and check out the article they posted from this shoot that includes quite a few additional still images from the shoot and also Marv and Jorge’s behind the scenes still images. This really was one of the best shoots of my entire career. I have set for myself a very high watermark that will be hard to surpass in the future. I am very proud of what we have created here both because it wasn’t a given, and we all had to work insanely hard to pull it off. Thank you to everyone who has posted on social media with feedback. It has been very encouraging to get such amazing feedback and see the reaction to this set of images. Paurav Shah - Excellent pictures it shows your hard work! Each image is masterpiece. And thanks for sharing the video and images. Best of luck! Martin Beebee - As a photographer and whitewater kayaker, I’m blown away with these images, Michael — truly some of the best I’ve seen. And thanks for the in-depth BTS info — shows how much work really goes into making outstanding unique photographs.